Back to Ireland with a bang! It’s been a few weeks since I’ve done this so sorry folks. When I arrived home from the Worlds I was pretty knackered and I planned to do nothing for a few weeks. That plan was going well until I went to watch a local crit. 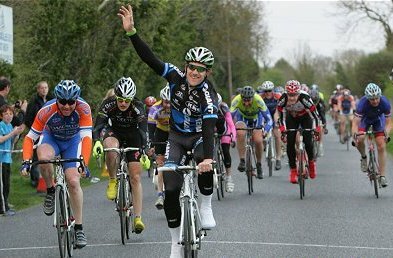 With a whole 4 days off I watched the Jazzer Wherity crit in Balbriggan and the racer in me wanted to do something, there was a race on the next day and I thought ‘screw it.’ It runs pass my door step so there’s no hassle getting to it. The race was the Ben McKenna memorial which has a rep for being a good hard race which proved right again. I rid the race knowing my endurance was questionable but I raced the way I usually do, aggressive. When the dust settled I was in the break and doing more than my fair share. After the 2 hour mark though my legs were saying all the wrong things. With a lap to go my hamstring and quads cramped up and that was my race over. Once the cramp had gone I rolled to the finish and still got 5th, not too bad for my first race back. The lower black line is altitude and as you can see there isn’t a bit of flat road in the race and there was a total of more than 1100 metres climbing! The numbers I’m happy with are the average power and the cadence. Nearly 320 average watts for over 3 hours is a good days training even though my heart rate was a little high. The average cadence was over 90 rpm which is rare for me, that’s the track work coming through. Oh yeah, I won the race too - my stock piling of miles during the week seemed to work. I really wanted to get a hard day’s training in so when the beggs was over I collected my trophy (which is massive!) and hit the road. I was hoping to make it to Drogheda for a 50k race that started at 7pm but I missed it by 5 minutes! I was pretty gutted. When I got there the race had just left, what was meant to be, may be next time. With a good weekend in my legs I kept training that week and the next thing in the plan was a race I love, East Midlands classic in the England. It’s an on road/off road race in which I did well before and the last time I rode it I was 5th. Before I headed over for the race I did a 50k race on Friday night which was only about 25k away. Knowing my Saturday was going to be spent sitting in a car I thought this was another chance to get some training in. I rode up to the race which took about 45 minutes and had a look at the circuit on the way to sign on. It was pan flat and had 4 corners, simple! It was a handicapped race with the A1+A2 riders being set off 2minutes after the A3+A4 riders, pretty hard considering it was only 50k long. In my head this race was going to go well or not, good result or good training, it turned out to be both. There were about 20 riders in my group so normally everyone would ride through steady to get the time difference down then the race would really start. Not so this time. There were only a handful of riders willing to ride hard and it seemed like I had a big target on my back. I tried my best to get everyone to ride but after a lap of trying I gave up and went to the back. I was there for a whole 5 minutes and 3 guys got off the front and got a gap. Ryan Connor, Javan Nulty and Paul Kennedy had about 20seconds on the group I was in. That group had my name all over it as these were guys willing to ride hard, so with a nicely timed attack and 1k of hurting myself I got over to them. The next 40 minutes or so I rid hard, doing longer turns and getting some quality threshold work in. The other guys did plenty of good turns too and with 1 lap to go the gap from us to the front of the race was 48 seconds. A small part of me thought that was it and we’d never get over but we kept riding. 3 or 4k later we had the led group in our sights and so I started thinking of the finish. The group had about 40 riders in it and it was gonna be hard to get past them. The road was only about 4 guys wide so there was gonna be an element of madness involved in getting past them. The timing couldn’t have been any better, with about 1k to go we caught the group, the next 500 metres or so was everyman for himself. With a bit of skill and a lot of luck I got through the group and kicked for the line. I couldn’t believe it, with 300 metres to go I hit the front for the first time in the race and that’s where I finished! It turned out that Paul and Javan finished 2nd and 3rd aswell which was only right, as we worked the hardest and were the fastest in the race. Ryan didn’t make it through the group and I don’t think he could believe that we did! 1 minute before this was taken we had just caught the group!